Savage Beasts is a collection of stories from Grey Matter Press, featuring authors John F.D. Taff, Edward Morris, Karen Runge, Shawn Macomber, Daniel Braum, T. Fox Dunham, E. Michael Lewis, J.C. Michael, Konstantine Paradias, and Maxwell Price, edited by Anthony Rivera. There’s no longer any need to ask yourself what Nine Inch Nails, Grace Jones, Wolfgang Amadeus Mozart and the Cuban missile crisis have in common. The answer can be found in the upcoming anthology of modern horror and speculative fiction from Grey Matter Press, SAVAGE BEASTS. 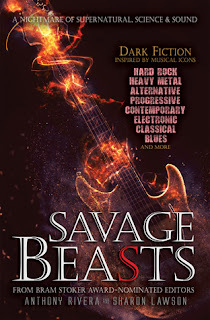 German philosopher Friedrich Neitzsche once said that “without music, life would be a mistake.” And the diverse assembly of international authors whose work is featured in SAVAGE BEASTS proves his point in dramatic fashion. Collectively, this group of dark fiction composers take readers on a nightmarish journey through the vistas of supernatural, science and sound with tales that will be the mistake of your life not to read. 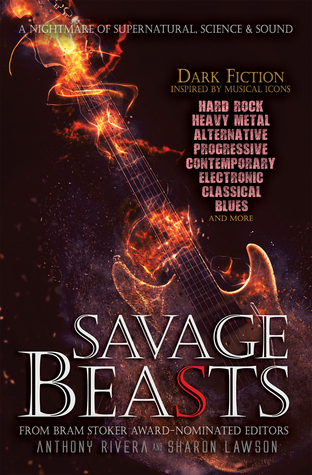 Featuring eleven short stories that offer readers a terrifying written recital, the genre fiction authors whose music-influenced work is collected in SAVAGE BEASTS, reflect some of the freshest voices in horror, science fiction and speculative fiction. A short collection of stories - speculative fiction slanted toward the horror genre - inspired by music. A couple stories didn't hook me but it's personal, the topics don't interest me, and that doesn't mean they won't appeal to someone else so I'm not pointing them out. Every story is well-written, the book is well-edited, and I found the collection, as a whole, entertaining. I read this book quickly; I wouldn't have minded a few more stories because these are quality stories that introduced me to new authors to check out (and that's what I love most about short story collections).